One of the most debated topics in football is the rivalry between Cristiano Ronaldo and Messi. Both players always show respect to one another and claim competition is healthy in pushing them to perform to their full potential. Their rivalry is rather tame in comparison to Roy Keane and Patrick Vieira’s legendary battles against each other on the pitch. For much of the early 1990’s Manchester United dominated the Premier League, winning four of the five titles between 93 and 97. Central to that success was their domineering and relentless midfielder from Ireland. Keane’s drive, determination and all-round excellence established him as the best midfielder in the country. When Eric Cantona suddenly retired in 1997, Keane was named United captain by Alex Ferguson. The previous summer, Arsenal signed a young Frenchman in the same position. Vieira struggled to make the grade at AC Milan and little was known about him in England. This was a time when Arsene Wenger was ahead of the curve and he knew value when he saw it. Vieira immediately impressed with his athleticism and passing ability, Arsenal supporters claiming he was the playmaker they’d been missing since 1991 title winner Paul Davis. Keane missed much of the 97/98 season with a cruciate ligament injury and when he returned the landscape had changed. Arsenal had taken United’s title away and lorded over them in successive three nil victories in the Charity Shield and League. Vieira later revealed that he felt if he got the better of Keane they would win and he certainly stamped his authority on those games. United responded to those setbacks and would compete on three fronts in 1999. Keane was instrumental and dragged them into the Champions League final with an imperious display against Juventus. In the last four of the FA Cup at Villa Park, the Arsenal-United rivalry arguably reached its peak in a classic game that had it all. Both would have significant impacts for all the wrong reasons – Keane sent off for two bookings and Vieira guilty of passing the ball straight to Ryan Giggs on route to his Mazy dribble, finish and chest-haired celebration. United were going to create history by winning the treble. The following season, United would maintain their spot at the top. 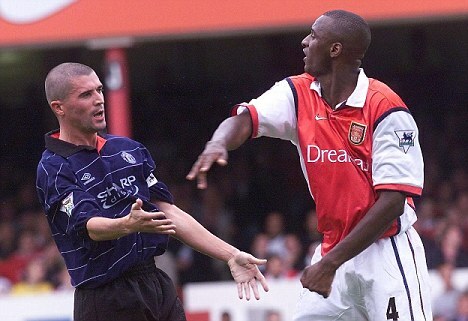 It was at this stage that the Keane and Vieira battles began to heat up. Keane scored twice at Highbury as United beat the hosts 3-1 in a game in which the two repeatedly clashed. Again United would go on to win the title, and Keane was voted PFA Player of the Year. As Keane later remarked, preparing to face Vieira was different. “A week before my body would be aching because I knew I’d have to go to battle. I didn’t think he was as tough as me.” After shock interest for Vieira from United in 2001, he stayed in North London and the season culminated in them winning back the league crown at Old Trafford, a game Vieira named as his best in an Arsenal shirt. They completed the double against Chelsea at the Millennium Stadium in his finest season to date. Just as Arsenal looked set to dominate, they surrendered a big lead in the 2002/20o3 season as United regained the title. Vieira missed much of the run in through injury, while a rejuvenated Keane lifted his seventh and final league in a red shirt. Early in the following season, the two sides were embroiled in a heated clash remembered as “the Battle of Old Trafford”. Ruud van Nistelrooy crashed a penalty off the bar in injury time with the chance to win the game and was angrily confronted by Arsenal players accusing him of getting Vieira sent off. The draw from the jaws of defeat would spur Arsenal on and they created history by going the season unbeaten on their way to another title. By the time 2005 came around, both sides were trailing in the wake of Chelsea. In February, the two met at Highbury in a game which turned out to be a classic. The tone was set in the tunnel beforehand when Keane famously confronted Vieira after the Frenchman had picked on Gary Neville. United won 4-2, inarguably Keane’s last great performance. They’d meet again in the FA Cup final in May – when Vieira scored the winning penalty in a shootout. Pretty soon afterwards, things would change. Vieira joined Juventus, and Keane would depart United in acrimonious circumstances a few months later. The Premier League has yet to see a rivalry to match it!